Since I don't sleep, I figured I'd try to pump out another blog post. And, since Josh already covered the good movies, I thought I would cover what was one of the biggest comic book events of the last several years, The complete obliteration of the DC universe! 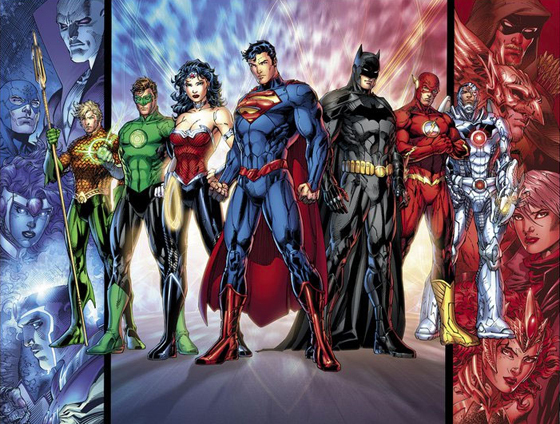 The DC reboot was something heralded by many fans, as the end of DC comics. There were those that saw the years of continuity being thrown out the window, and jumped ship. And then there were those that saw 52 new #1 issues and thought "These are going to be huge collector's items, I must buy them all." Somewhere in the middle of all of that, there were the moderates like myself who, while lamenting the change to years of familiar characters, realized that for many, the continuity was daunting. So while I watched many beloved characters disappear into the cracks, I decided to give the reboot a chance. In pursuit of giving them all a chance, I read the 1st two issues of each book, much to the chagrin of my bank account, and then proceeded to drop ....well... Most of them. The move in part, was because some of the stories were just not all that interesting, with characters that I felt were just not all that interesting or enjoyable ("Blue Beetle", "Static Shock", "Hawk and Dove", "Mr. Terrific", and "OMAC" all come to mind). There were books that made little to no sense in the terms of universe building (I'm looking at you "Men of War" and "All Star Western"). And then there are always the characters that I just never cared for, and a reboot just wasn't able to redeem them in my eyes (Hello "Aquaman" and "Wonderwoman"). So with all this negativity, one might ask themselves... What titles did I let get past issue 2? ...BEHOLD THE LIST! So, I kept around 25 out of 52, with 9 to likely be dropped in the next couple months. And since I like lists, below is a list of what I believe to be the best books in the New DCU, in no particular order. -Nightwing -Great story, great art. All in all a very enjoyable read. -Catwoman- While initially a little off-putting, once you get through the first issue or two, the story becomes rather enjoyable. With great art throughout. Initially accused of blatant misogyny due to Catwoman's, at times rather skimpy, attire and some promiscuity issues, it has mostly gotten over those issues. -Batgirl- This one was a hard sell for me. I had become so used to Stephanie Brown filling Batgirl's cowl, that seeing Barbara Gordon back was more than a little off-putting. However, the art and story have made me change my tune, and while I lament Stephanie's disappearance, I am ready to embrace Barbara Gordon as Batgirl. -Batman- The initial story arc is at least mildly interesting, and has had some fun art to back it up. The writers seem to know how to end an issue on a cliffhanger to reel the reader back in for the next issue. Kudos to them. -Detective Comics- My biggest issue with this one has been the art at times... Other than that, I'm enjoying this, and look forward to seeing what this can add the the Batman mythos in general. -Supergirl- In later issues of the old series, Supergirl was reduced to nothing more then a petulant teenaged girl version of Superman. Throwing fits about not being able to lead her own life, etc. In the new DCU Supergirl has been revamped, and made to be a true foreigner to this world. She doesn't know how to speak any language other than Kryptonian, so she has to let her actions speak for her. Sure, she's still a teenage girl, but she is not focused on Superman's mission, but rather on finding herself. It looks to be shaping up to be a very good story about a girl just looking for her place in the world. -Green Lantern- Despite the soul-sucking atrocity that was the Ryan Reynolds-lead "Green Lantern" movie, "Green Lantern" as a concept still rates highly in my books. And displacing the 4 human lanterns in favor of making the primary Lantern of the book an old Green Lantern villain has been an interesting choice. Throughout the story so far we have really got a chance to explore Sinestro's moral code, and delve deeper into why he is what he is. I shudder to think what might happen if they succeed in making him a sympathetic character. Just a little more to go guys, I swear. -Making the new universe accessible to those that feel left out in the cold due to the immense amounts of back story. -Complete disregard for fan-favorite characters like Stephanie Brown and Power Girl. In conclusion, in my eyes, the jury is still out on the reboot. Has it changed the status quo? Yes... But, was the change really needed? I don't think so. Where will things go from here? Who knows. I'll give it another year or so... At this point, things are just not far enough along to get a good feel for everything.